The inspiration for beautiful music! Bird song caught the ear of Italian composer Antonio Vivaldi. And he even named a 1729 flute concerto for a bird — the goldfinch. 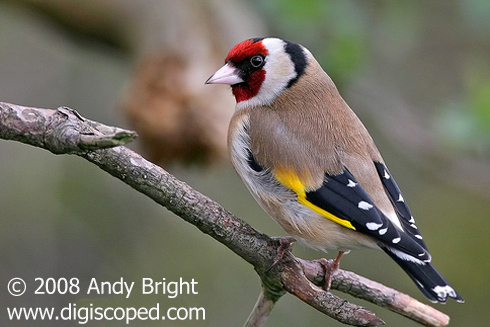 The source of inspiration for Vivaldi's Goldfinch concerto, or Il Gardellino, was the European Goldfinch, a tiny bird found throughout much of Europe, where it frequents gardens and roadsides. No wonder Vivaldi found the goldfinch irresistible. BirdNote is supported by viewers and listeners. If you'd like to make a gift, begin here. The source of Vivaldi’s inspiration? The European Goldfinch! It’s a tiny bird found throughout much of Europe, where it frequents gardens and roadsides. [Song of European Goldfinch] And it has the looks to match its sparkling song. Its striking red-and-white face is set off by yellow and black wings. Song of the European Goldfinch recorded and provided by M. Stewart, naturesound.org.